I traveled by plane a lot this year, and wanted to share one of my favorite airport outfits. It's easy, comfy, and classy. 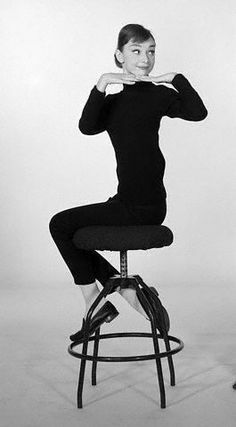 I am a big fan of old hollywood movies and film stars, and was inspired by the menswear look that Audrey Hepburn wore in her Funny Face dancing scene. I wasn't blogging yet at the time of the trip, so my sister helped me re-create this look at home. Top: The Painter short sleeve t-shirt from J.Crew. I love love love this shirt! The cut is flattering, the material is high quality, and it can be dressed up or down very easily. I have it in black, white, pink, yellow, red stripe, blue stripe, and black stripe. I wear these shirts all. the. time. Pants: Also by J.Crew, the Martie pants in bi-stretch cotton. The fit is slim and flattering, but loose enough to be comfortable and not constricting. I like the cropped length because I'm 5'3" and it's a relief not needing to get them hemmed. The shape and length are what make me think of Audrey Hepburn in Funny Face. They are a bit high-waisted on me because I have a short torso, but I don't mind because I'm currently loving that look. I'm definitely considering buying these pants in more colors! Shoes: The Barlow Mule from Madewell. I wore them with thin crew socks for the plane. I love these at the airport because it's easy to slip them off and on during the security check. They are easy and comfortable, yet still add an element of style to any outfit. They do stretch a bit with wear, so if you plan to buy them I'd recommend getting your true size. Purse: Medium flap leather handbag by Genuine People. I love the look and color of this bag. It's a neutral gray that goes with anything, and the aesthetic is unique. I won't, however, be using it for air travel again. I found myself wishing it had compartments to keep all my airplane essentials organized. I hate having to dig through everything to find what I'm looking for. I also found I prefer to air travel with bags that zip securely closed. It still does get frequent every day use, though. Accessories: Personally, I'm not big on wearing jewelry at the airport. My only "accessory" was a pair of bluetooth wireless headphones by Ava from Urban Outfitters. I am by no means a headphone snob. These headphones are stylish, have above-average sound quality, and didn't break the bank at $50. This is my very first OOTD post! What kind of outfits would you like to see? Any events or trips you'd like us to share outfit ideas for? Any brands, websites, or specific items you'd like us to review? Send us a message here. You can also tag us with #delawears to show us your favorite airport and travel looks. We'd love to share! Thanks for reading. Until next time, peace and love.